December 23, 2011, Kyoto, Japan: GS Yuasa Corporation (Tokyo Stock Exchange: 6674) announced today that its industrial lithium-ion battery module LIM50E-8 has been chosen to power the first electric bus put into service by a private-sector company in Japan. The LIM50E-8 is a lithium-ion battery that incorporates GS Yuasa’s pioneering know-how in large lithium-ion battery development accumulated over many years. The LIM50E-8 battery’s energy density per unit volume is more than 50% higher than previous lithium-ion batteries, making it ideal for uninterruptible power supplies (UPS), power storage systems and other high-capacity applications, in addition to electric buses. This electric bus powered by the batteries was developed under the guidance of Professor Yushi Kamiya, Faculty of Science and Engineering, Waseda University with the key attributes of short-distance travel and frequent charging. These attributes made it possible to greatly reduce the battery volume and mass, which have been key stumbling blocks with conventional electric buses. Professor Kamiya’s research and development into electric buses has been recognized by the Japanese Ministry of the Environment, Ministry of Economy, Trade and Industry and the New Energy and Industrial Technology Development Organization (NEDO) and other organizations as a model project. 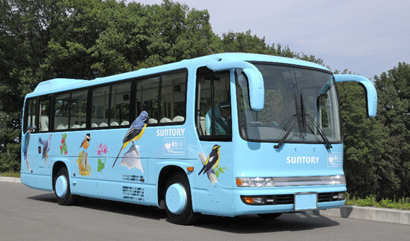 Suntory introduced the bus for its plant tours after determining that it matched the operating requirements, and became the first private-sector company to introduce an electric bus. The vehicle went into service on October 29th for tours of Suntory’s Natural Mineral Water Minami Alps Hakushu factory in the Yamanashi prefecture. Compared to previous GS Yuasa batteries, the energy density per unit volume is more than 50% higher, and the energy density per unit weight is more than 30% higher. Yuasa industrial lithium-ion batteries is included as a standard feature. The device continuously monitors the voltage of all the cells and the module temperature, and has a function for sending the information to the charger and the system. The battery structure has been designed for mass production, making it possible to reduce the battery cost and offer superior cost-performance to customers in many different industries. Vehicle: Hino Motors, Ltd. EV Modification: Flat Field Co., Ltd.